Free shipping to United States with $35 purchase from BeadBistroCrafts. See item details below for sale terms. Special offer details: 10% OFF select items! * this COLOR has a Silver Splash finish, over an opaque Jet Black base glass. 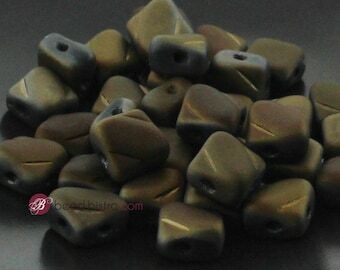 These 2-hole Czech Kite beads are part of the extensive collection of NEW 2-hole shaped Czech beads. They are made to work well with many other 2-hole beads. * PLEASE NOTE: the last image is to show you how you can use the 2-hole Kite bead in a Pattern. Very fast shipping, excellent packaging, beads are as described and what I hoped! Ordering more. Gorgeous mix! Will be great for a wrap bracelet! 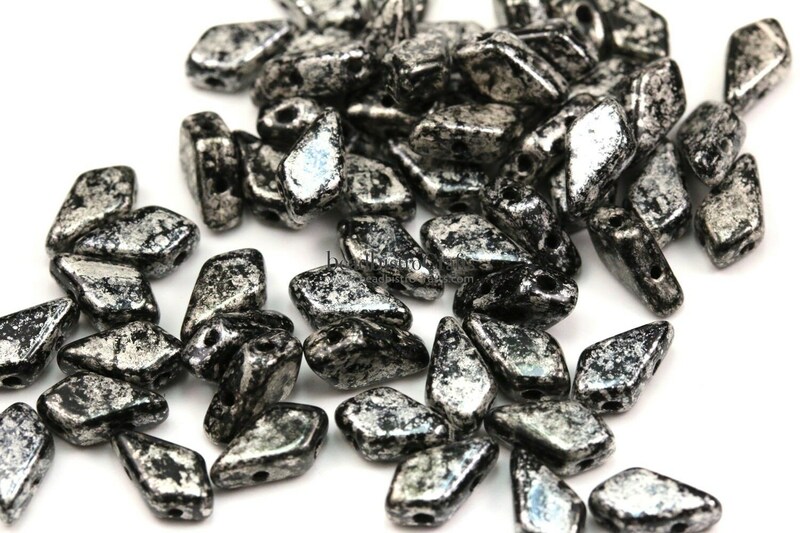 Great little beads, perfect for project! Orders will be shipped once payment is received. FOR INTERNATIONAL ORDERS ONLY - Each country has its own import/export duties and restrictions. All duties/taxes are the responsibility of "the buyer" - Please check with your countries importation laws for specifics on customs fees, excise taxes or VAT fees on item from the USA. We comply with all Import/Export laws, when declaring the value for customs. * Please contact Jess via Etsy conversations. ~ Exchanges may be granted depending on the circumstance. * BeadBistroCrafts is not liable for return shipping when buyer is displeased with the item, at no fault of BeadBistroCrafts' (please refer to the welcome message for details & disclaimers on colors, finishes and bead approximations). ~ Please see Delivery problems, insurance and reimbursement section below if you need a refund for any other delivery related issues, and please contact Jess via Etsy conversations with your concern. ~ Please note: Business days do not include Saturdays, Sundays, or legal holidays. ~ Expected delivery varies with shipping method. Delivery time starts when the package tracks as shipped. Please note: We can't guarantee these approximate delivery times. These are estimates given by the US Postal Service for shipping services provided by the USPS. ~ an incorrect billing or shipping address provided by the customer. * you will have FREE INSURANCE on your package incase of damage or theft. * you can use coupon code BISTRO for 10% off. ~ COMES WITH INSURANCE through USPS for up to $99.00 order value. estimated 1-3 BUSINESS DAYS for delivery. Deliveries generally take between 7–21 business days to arrive, although USPS does not guarantee delivery dates or times. Delievery can take longer for some countries or due to a package being held up in Customs. ~ DELIVERY DELAYS - Shipping times are an estimate only - If your package does not arrive in a timely manner you may want to check with your local customs and/or post office. customs can hold packages for up to 45 days. Your package is considered proprietary information and law prohibits us to call your customs office. We are also not able to see tracking of your package once it has left the USA. However we are happy to assist you as best we can should you need help. ~ DUTIES - Each country has its own import/export duties and restrictions. All duties and taxes are the responsibility of "the buyer" - Please check with your countries importation laws for specific prohibitions, customs fees, excise taxes or VAT fees. We comply with all Import/Export laws, when declaring the value for customs. ~ TRACKING - We are provided with some details of tracking for International orders, however the tracking may not update once the package is in route within your country. We insure all International First Class mail, and refunds are given for undelivered/ damaged packages if buyer complies with POLICY requirements of our Insurance provider. ~ We are generally very satisfied with USPS as our shipping provider; however accidents do occasionally happen during the shipping process, long after the package is out of our direct care. This is why we offer options with shipping insurance. * DOMESTIC PACKAGES of $40.00+ ARE ALWAYS INSURED. Domestic orders (without shipping upgrade or UNDER $40.00 total order value) WILL NOT be INSURED. ~ You may choose to upgrade for added Insurance at checkout. ~ You may also choose to upgrade to PRIORITY USPS Shipping with insurance (through USPS) for up to a $99.00 order value. We cannot be held responsible for uninsured, damaged or lost Domestic parcels that have scanned delivered in the tracking. Please contact Jess via Etsy messages if you have any delivery problems. * INTERNATIONAL PACKAGES ARE ALWAYS INSURED. ~ In the rare case of a delivery problem, an insurance CLAIM may need to be filed. * With your cooperation we will try to make it as painless as possible. * USPS Priority - If the insurance coverage is via a USPS Priority shipment, the customer will be the direct party to reimbursement from the Insurer. ~ It is our goal to fully reimburse you for undelivered packages & your patience and cooperation is appreciated. ~ For insured packages ~~ a refund will be granted once the insurance claim has been filed (as long as buyer complies with our insurance policy). ~ We require (from the date of mailing) 21 BUSINESS DAYS for Domestic orders, & 45 BUSINESS DAYS for International orders, before we can make a claim for a lost package. The buyer is also required to sign an electronic affidavit, confirming that he/she never received the package, or confirming damage. Once we receive the returned affidavit the claim process will begin and a full refund will be made. ~ We always provide a printed packing slip in all packages. ~~~ If you ever have any discrepancies with your packing slip you can pull up your original Etsy order on your profile (under PURCHASES & REVIEWS). Each order will allow you to view the receipt & show the discounted amount deducted from a coupon code or store sale during the transaction. If you have any further questions please contact Jess via Etsy messages. How many beads are in 20g / 10g ? ~ Some Czech beads are weighed out by the gram (such as the SuperDuo and MiniDuo beads). The quantity of beads per gram can vary depending on the finish & size of the beads. Below are some general approximations. 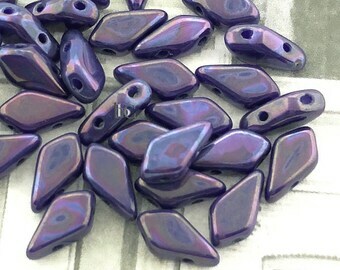 Will this color/ finish look like the beads in the image shown? LIGHTING can make the color appear darker or lighter/brighter. Our photography is done in a light box with LED lights (similar to natural day light). The color may look slightly different indoors or in low light. COMPUTER MONITOR settings, can cause hue & color to shift slightly from our original image. PRODUCTION LOTS - With Cottage Industry production of Czech glass beads, a finish/glass can be slightly different when a new production batch is made. If this happens, I will tell you this in the descriptions. Why do a few Czech beads have clogged holes? This is not a defective batch. 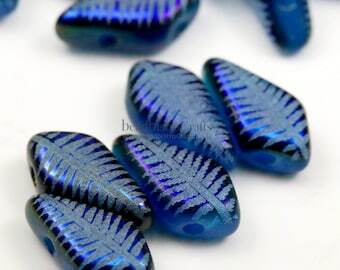 Though you will probably only find this in 1-4 beads per pack, it does occasionally occur in pressed Czech glass beads. The Cottage Industry bead pressing process means a few defects can slip through during productions. The glass is molten and pressed with rods between to form the shape & holes. After cleaning/polishing, beads are then finished. 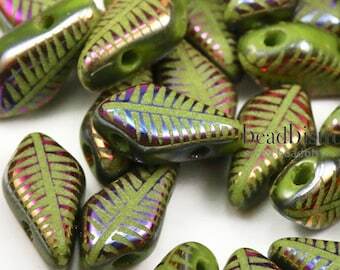 The entire process for 1 batch of beads, start to finish, can take upwards to 1-2 weeks. You may find occasionally that one of the holes is clogged. Please check all of the holes as you are stringing each bead. Checking the holes as you go is common practice among 2-hole beaders & makes for bead project success. Why are some Czech glass beads more expensive than others? Czech glass beads are made of a base glass & sometimes one or two glass finishes applied to the base glass. 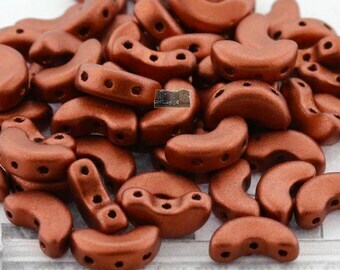 There can also be cutting or fire polishing processes for certain bead styles. * The cost depends on the base glass (raw material), the elements/chemicals needed to assist in the finishing process, & any specialty finishing/cutting processes. ~ For instance some Pink glass rods need a certain amount of Gold to achieve the hue of Pink within the glass. To the best of my knowledge I will inform you about which beads are solid glass colors & which finishes are on these beads in the descriptions of each item. Why do some Czech beads have finishes? Since certain colors or types of glass are difficult or expensive to produce Czech glass beads are often finished to achieve new looks. Glass finishing processes took hold in a time when the era of costume jewelry began (around the 20’s). Czech glass bead makers have been expanding upon these finishes ever since. *** It is important to note that abrasives & chemicals in perfumes & lotions can cause these finishes to deteriorate. Keep your seed beaded jewelry separate from other jewelry & don’t wear these pieces at times when you may cause damage to these finishes.